So we’ve already listed our top 5 decanters for red wine, so it’s only fair for us to list our top 5 wine decanters for white wine! When it comes to decanting, it’s common for people to only decant red wines, but why should white wines miss out? We accept that decanting red wine should be the norm, but decanting white wine does also make a big difference to the overall taste and experience. There’s also a visual aspect too, if you’re dinning at home and your red wine is sat on the table in a nice bowled decanter, your white wine should be treated similarly and giving the same care and attention rather than kept within the bottle. We stock a varied range of wine decanters here at Wineware, but whatever your preference, we’re sure we stock something for everyone in our vast collection! 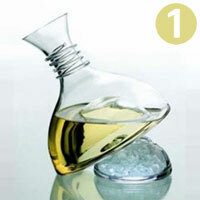 Below we’ve listed our top 5 ‘Best wine decanters for White Wine’. The white wine decanter with ice bowl keeps your wine and ice/water separate! Fill the bowl with ice and the decanter with white wine, your wine won’t become ‘watered’ down but it’ll still be chilled because of the bowl beneath! This unique decanter would make a great gift for any white wine enthusiast! 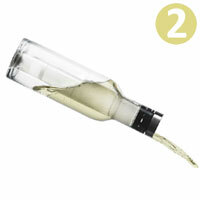 The Menu ‘CoolBreather’ carafe allows you to decant your white wine pouring straight from the bottle. The frozen water coolstick simply inserts into the middle of the carafe, keeping the surrounding white wine chilled until the wine has all gone! A red wine version of this decanter is also available. 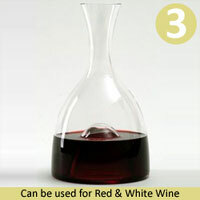 The Visual decanter can be used for both red and white wine. The traditional and classic shape is great if you’re after a simple but effective decanter. It’s easy to hold and pour with the inner dome at the base; this increases oxygenation as the wine is decanted and allows temperature to be more readily gauged. The Ice Pocket decanter is totally unique and different to anything else out there. The pocket allows you to store crushed ice and cold water, which will in turn keep the white wine that is enclosed within the decanter chilled. The natural cork stopper prevents the ice/water from escaping and spilling and prevents spillage when pouring. Handmade. This smart, slim line mouth-blown carafe is perfect for White wine. It has a simple design and it’s easy to hold and pour. An added advantage of this carafe from Zalto is that if you don’t finish drinking your wine and there’s wine left within the carafe, you can simply pop it back into the side door of your fridge! Handmade. 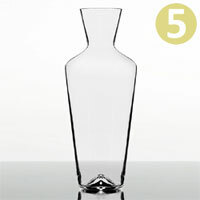 So there you go, Wineware’s top 5 wine decanters for white wine. Do you agree or disagree? Do you have your own wine decanter you use for white wine that isn’t featured? If so, let us know! Contact us via Facebook or Twitter as we’d love to hear from you! 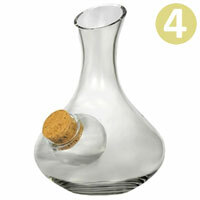 Click here to view our full range of Wine Decanters.